The education watchdog in England said in too many cases action to protect young people at risk was not "timely". 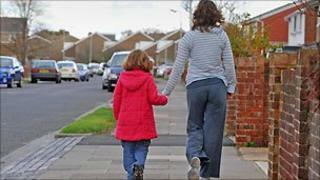 It said children's social care services remain under pressure as demand rises. The authorities deemed inadequate were Cornwall, Warrington, Leeds, Sandwell, Calderdale, Salford, Peterborough, Nottinghamshire, Birmingham and Essex. The 10 authorities were identified out of a total of 29 that were inspected this year, although inspectors focused particularly on areas they were already concerned about. Rising demand for child protection services has been boosted by a surge in referrals since the high profile death of baby Peter Connelly in 2007. In its annual report, published on Tuesday, Ofsted said referrals to children's social care services had risen 11% from March 2009 to March 2010, and councils were reporting a "marked increase" in the complexity of cases. But chief inspector Christine Gilbert said there was a "huge difference" between local authorities in how they handled that pressure. The report said that in many of the local authorities labelled inadequate, rising demand, poor planning and management led to "high caseloads, overuse of agency staff, turbulence in front-line teams, and the exposure of new and inexperienced staff to a volume and complexity of work that they struggled to deal with". "The problems are deep," said Ms Gilbert, but noted that local authorities coulcd not "wave a magic wand" and the work needed to improve operations would take time. A high proportion of these authorities also showed weaknesses in their secondary schools and provision for young people aged over 16, the report said. However, Ofsted also found that the number of local authorities rated "excellent" across all their children's services has doubled, from 10 last year to 21 in 2010. It also reported that there are now more outstanding children's homes, and fewer inadequate ones, than at any time since Ofsted began inspecting them in 2007.